Now that we’re deep into winter, it’s time for another seasonal variation on our pipe cleaner trees. These black trees started out as spooky trees for Halloween. Then we added color for Halloween carnival pom pom trees and fall pom pom trees. Now, soft pom pom snow and hard glass gem ice has landed on their branches. 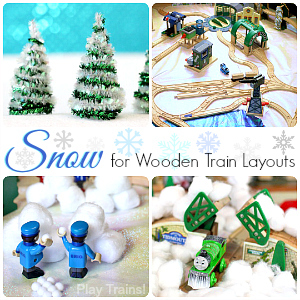 These trees are fun to use as a fine motor activity on their own, or to be added to train sets and other small worlds as interactive scenery. 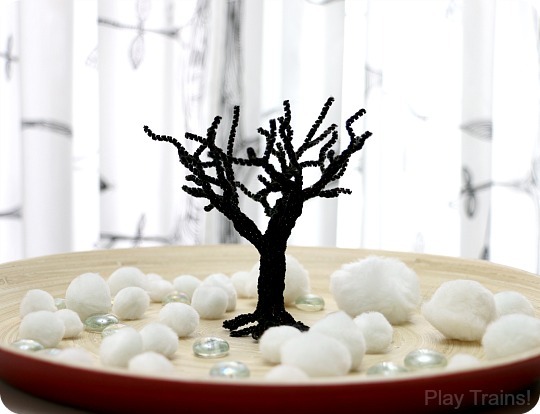 Pipe cleaner trees — Read the illustrated tutorial for making these pipe cleaner trees. 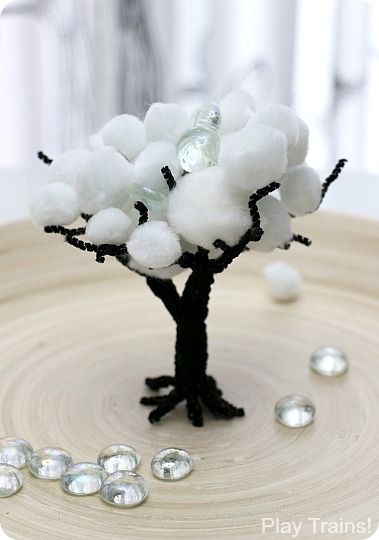 White pom poms — Cotton balls would also work. 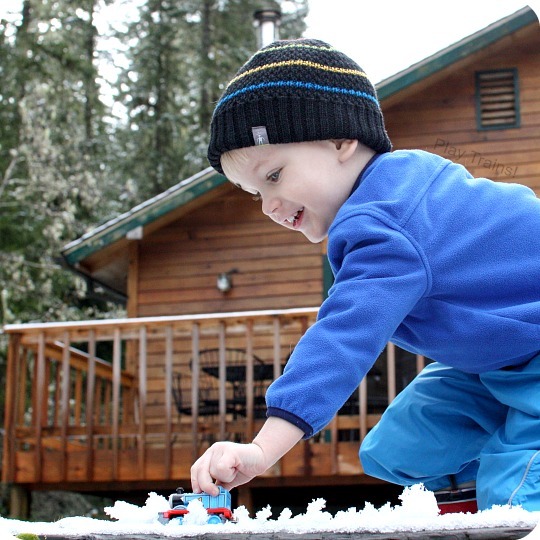 To present this as a fine motor activity, place one or more pipe cleaner trees in the center of a dish or tray with raised sides to contain the loose parts. Strew the pom poms around the roots of the tree. 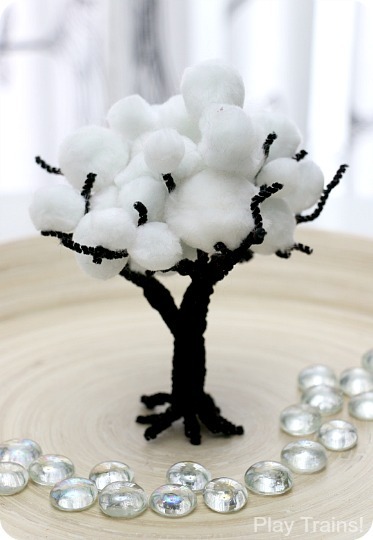 If you feel a suggestion for play would be helpful, place a pom pom or two in the tree. 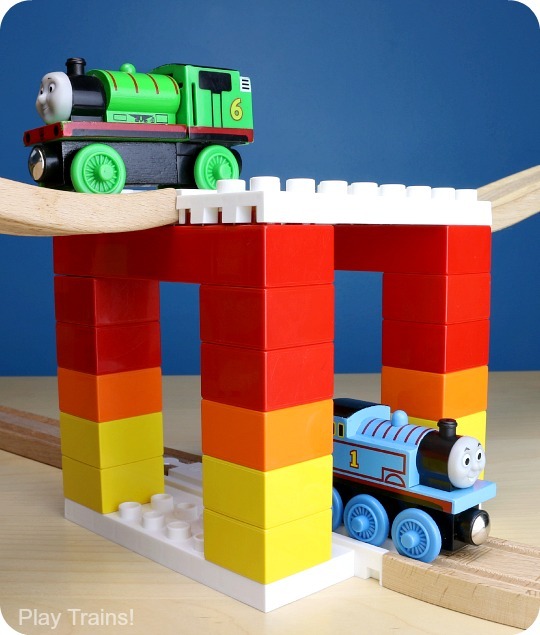 To add this to a train layout or small world, you can put the pipe cleaner tree, pom poms, and gems in the scene with your child. 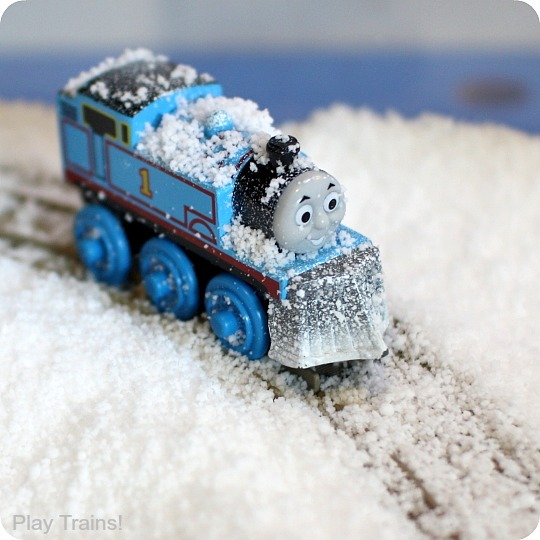 One way to make this more fun with trains is to use the trains to transport the “snow” and “ice” to decorate the tree, like we did for the Halloween carnival trees. 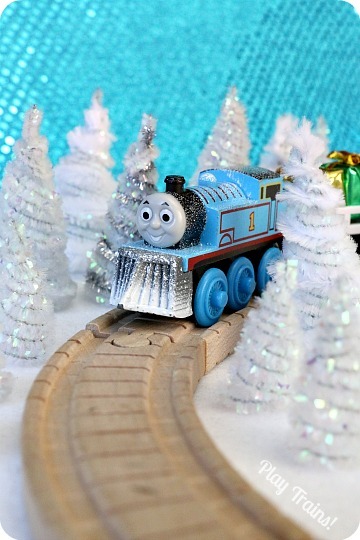 I liked that the gems could be used in many ways, as ice on the ground, arranged in a curving, iced-over stream (I’ve been wanting to make a glass gem river ever since I saw Twodaloo’s beautiful Invitation to Play: Create a Forest), or placed up in the tree. Getting them to stay in the tree presents an interesting fine motor challenge, because unlike the pom poms tending to stick to the pipe cleaners, the gems want to slid right through if they can. 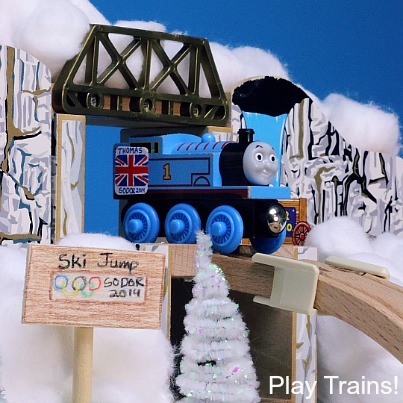 For more snowy trees to add to your train sets, check out the snow-covered trees in our pipe cleaner Christmas tree craft tutorial, and then check out some of our other ideas for winter train fun below!